Eek! I have several photos to share and yet I have been so lazy about making a post. My punishment? Doing one big post as concise as possible. gah! October – the household and a couple of friends went to Mack’s in New Hampshire for apple picking and squash overdosing. Personally I purchased four squashes: a delicata, two sweet dumplings, and a sunshine (which I later learned is a variety of kobocha, aka Japanese pumpkin). I liked the delicata fine, but it wasn’t anything special. I adored the sweet dumpling, but maybe that is because I stuffed it with spiced apples. The sunshine was definitely a favorite, but I was sad that I had stuffed it with apples too. The sunshine squash had a flavor a lot more like chestnuts than like your normal squashes. November – I started to make a lot of batches of what I like to call “pancake muffins.” They are exactly like what they sound like. Pancake batter cooked in an oven instead of on the stove top. So much faster and cleaner! And in easy to grab serving sizes too. I have been using the Bisquick Healthy mix (because I am too lazy to even mix together basic pancake batter) with yogurt as my liquid to simulate a yogurt pancake batter. I’ve tried blueberry yogurt (the house favorite), strawberry (also pretty good), apple with cinnamon (very disappointing flavor-wise), and mixed berry. Last night, I made a batch with raspberry yogurt. Basically, the more flavorful yogurts work best for this. Once the batter was mixed, I plopped it into a muffin tin at 375F for about 15 minutes. They taste best straight out of the oven, but keep well in the freezer. The only downside to storing in the freezer is that they seem a little drier after you reheat them. Seriously though, pancake muffins have become my latest addiction. They also seem to keep me full longer than my favorite healthy cereals. December – the new obsession? Challah bread. I made my first loaf last weekend and I’m making my second loaf as we speak. I nearly freaked out when I was in the middle of making my first loaf. In a moment of ditziness, I used water from my Brita filter… the same Brita that I keep in the fridge for cold water. Three hours later, the dough had barely budged. I was worried that I had ruined it. Luckily, I’ve had some introduction to slow fermentation using colder temperatures, I didn’t think all was lost. So I decided to warm up the dough in a slightly warmed oven. Once all of the chill was gone, I left my bread bucket with my dough on my kitchen counter. Three hours later, it had doubled beautifully. I went about braiding it (also my first time) and let it do it’s final rise (and skipped the second rise completely because it was getting rather late). With the slow fermentation accident, I wondered how it would turn out if I did a proper slow fermentation challah bread. On top of that, I had been watching bread videos featuring no-knead techniques which is basically a slow fermentation (http://foodwishes.blogspot.com/). Couldn’t the two be put together? I thought I was onto something interesting. I realized today that I wasn’t all that original. Googling “no kead challah recipes” spit out more responses than I had expected. Eventually, I came across a post on Steamy Kitchen (http://steamykitchen.com/blog/2008/01/13/challah/) that seemed to have exactly what my head was thinking of experimenting with. I thought about re-using Beth Hensperger’s recipe, but decided to go with what was on the Steamy Kitchen blog. Overall, the measurements weren’t too different. My only substitution was to use oil instead of butter. So now, I have a dough just hanging out in my fridge, waiting for tomorrow when I will actually shape and bake it. 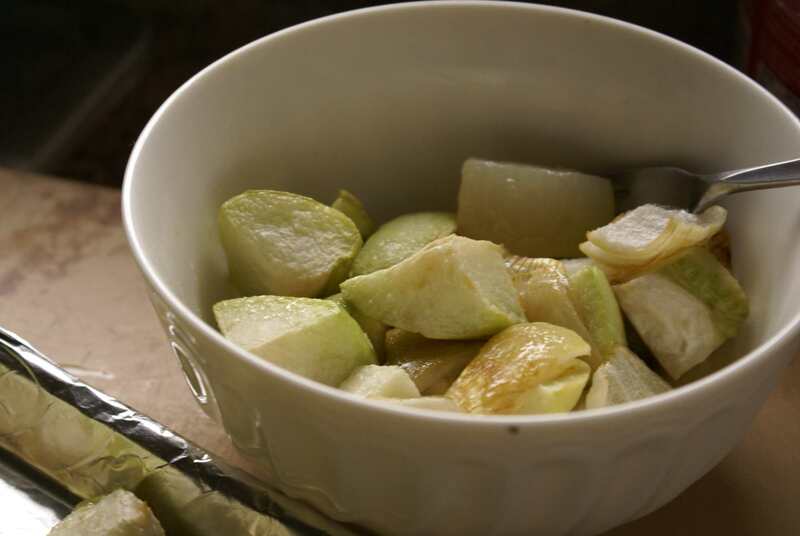 Call it chayote, merliton, hup jeung gwa, or whatever you want, it’s my favorite squash these days. Zucchini and yellow squash doesn’t do it for me. They’re squishy. They’re lackluster. As far as I’m concerned, zucchini belongs in quick breads and not on my plate as a side dish. Ah, but chayote? It’s such a delicate flavor – just barely sweet. It tends to absorb the taste of whatever it’s being cooked with. The texture? It’s on the firm side of squashes. I had googled “chayote squash recipes” one day and was thoroughly put off. 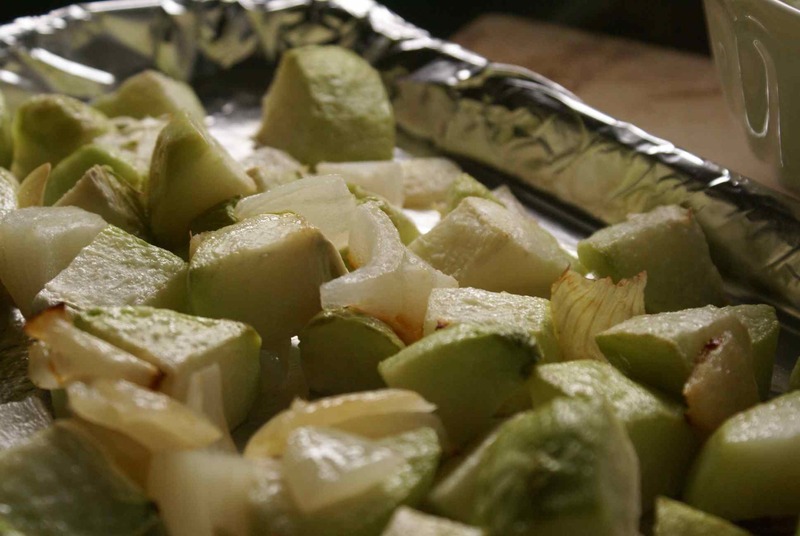 So many recipes demanded that my little chayote be covered up in herbs, sauce, or… eww, cheese. I felt like it was misunderstood. The result? Well, I ate two-thirds of it in one sitting. I’m so full right now, that I have to take a break before I finish the rest of my dinner. Sometimes, I’m such a glutton. *blush* On the bright side, it’s a fairly healthy side dish. 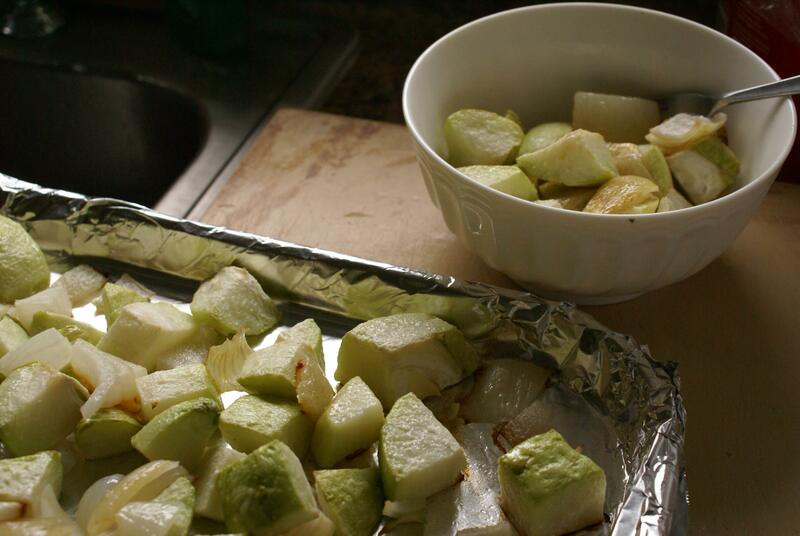 I find that chayote does well when roasted. After it’s done cooking, it’s still wonderfully moist and pairs so well with just onion. I remembered to take photos. I can’t let Asano-mama receive all of the attention for her whale cake, can I?